Synopsis: “Disney has announced that they will be rereleasing Beauty and the Beast, Finding Nemo, Monsters, Inc. and The Little Mermaid in 3D in movie theatres nationwide. 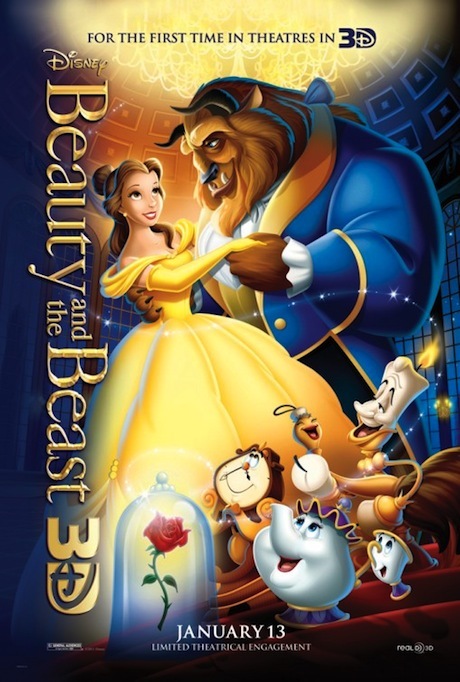 Belle, whose father is imprisoned by the Beast, offers herself instead and discovers her captor to be an enchanted prince” (Walt Disney Studios Motion Pictures). 3D effects of films to do it justice, like an IMAX cinema. There are also notable unfixed background flaws in some of the scenes. too free? Besides the prince was still very young when he was tested. Maurice’s wood-chopping invention to free Belle and her father from the basement? And lastly, is Belle the strongest girl in that universe? Short film shown along with the film: Entitled “Tangled Ever After“, a 3D mini-sequel of Disney’s recent animated film, Tangled. Second opinion: “Although it’s been so long since I’ve seen it, it still almost brought me to tears at the end” (Iris Loong). Special thanks to ChurpChurp for the invitations to the screening of the animated film. hahahahaha unbelievable post! Somehow I feel a little cheated because the cartoon timezone it is too fast!! The awesome moment when the beast is transformed back, with the whole castle.